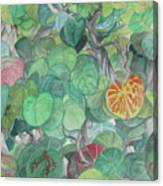 Tropical Leaves by Judy Riggenbach - 10.000" x 6.500"
Tropical Leaves framed print by Judy Riggenbach. Bring your print to life with hundreds of different frame and mat combinations. Our framed prints are assembled, packaged, and shipped by our expert framing staff and delivered "ready to hang" with pre-attached hanging wire, mounting hooks, and nails. There are no comments for Tropical Leaves. Click here to post the first comment. This is a bush/tree I saw a lot of in Florida. the leaves were turning red and orange with the winter, though the veining of red and yellow seemed to be not seasonal. 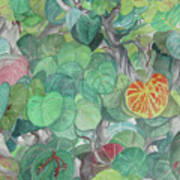 an award winning artist, Judy C. Riggenbach is a graduate of Rochester Institute of Technology's Art and Design program. A life long Resident of the shore area of New Jersey and being an enthusiastic and experienced sailor the ocean and water of all kinds play a large part in her paintings. 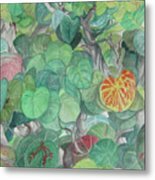 While people and places seem to wind up her primary subject matter Her heart belongs to the field of Fantasy Illustration. Having a daughter who is a New York Times Best Selling Author specializing in young Adult and Children's Fantasy she feels at home in that field.